I haven't yet read Towles's debut novel "Rules of Civility", but I have read many good things. So when Book of the Month had "A Gentleman in Moscow" as an option back in September, it seemed an interesting pick. Then I managed to get DC book club to read it, and it was a great choice. Count Alexander Rostov is sentenced by the Soviet government to live out the rest of his life in the Metropol hotel, granted a reprieve from the death sentence due to a poem he authored that inspired many during the communist revolution. He will be killed if he ever leaves. So Rostov sets up a life for himself within the walls of the hotel with both the staff and guests. As time passes, his relationships deepen and remain central to his life, and the novel. Although he is largely isolated from the events of the world outside the hotel, occasionally the changing world finds its way into the hotel's operations. A novel about a man determined to find the best in those around him, to tenderly care for his relationships with those he loves, and to live his life as best he is able in his reduced circumstances. Towles obviously took care with his writing, but his prose doesn't quite make it to that joyous effortless plateau that should be the aim of literary fiction. Towles slips at times, especially early on when the Count wanders into past reminiscences that are mere devices for filling in backstory. But as the story progresses (and the reader has the requisite backstory), these trips into the past occur more naturally and Towles finds his stride. Overall, this novel was a delight to read. The Count's outlook is optimistic, and that viewpoint effuses the reading experience with a certain joy, even in its darker moments. Verdict: Affirmed, it was widely enjoyed by my book club & would make a great pick for yours, too! 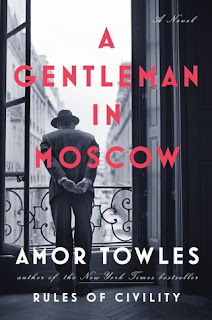 "A Gentleman in Moscow" by Amor Towles, published September 6, 2016 by Viking.